Scientists claim that swine hosts in its body a big number of parasites and that more than 50 kind of them affect human beings. It is classified as diseases, which are common between animals & human beings. Today in most muslim nations, muslims are found enjoying a good health since swine meat is forbidden. On the other hand other nations who follow the western style in their feeding constantly suffer from diseases that are wholly linked to the habit of eating swine meat. Subhan-Allah! It's just one of those times when you KNOW you lucky! 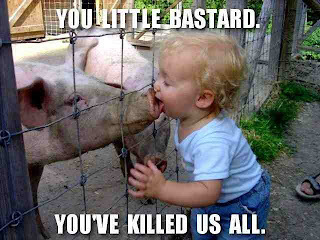 Boy am I glad...But imagine the irony if I do die of ''swine'' flu! Matta fact let's not imagine that at all...Get that filty thought outta your head!